This week’s Sea-Floor Sunday highlights the very upper reaches of Monterey submarine canyon (central California coast). Monterey Canyon might be the world’s best-mapped submarine canyon. If you google it, you’ll find plenty of information about it. This particular image is from a 2005 GSA Bulletin paper by Smith et al. 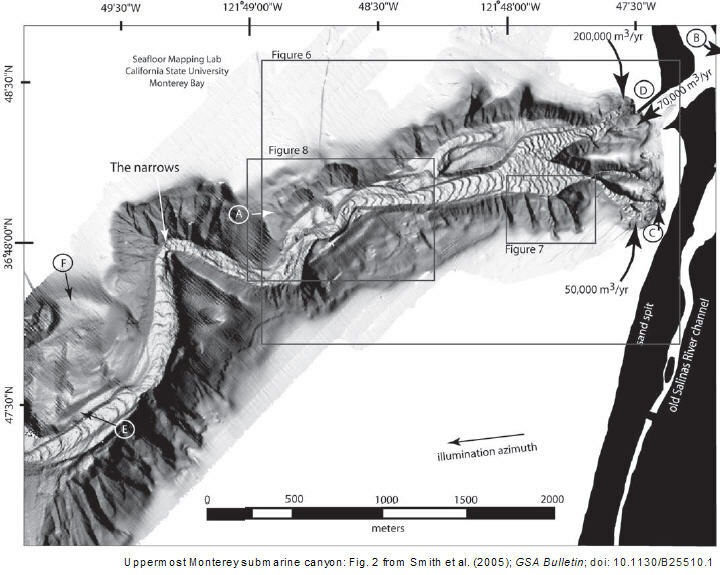 (2005) from Cal State Monterey Bay called “Semiannual patterns of erosion and deposition in upper Monterey Canyon from serial multibeam bathymetry” [link]. What they did in this study was analyze a series of sea-floor images over time to investigate changes. It’s a cool paper, I recommend taking a look at it if you’re interested in this stuff. The cool thing about this image is how high-resolution it is — this particular multibeam system achieved 3 m resolution. This is awesome! In terms of sedimentation (deposition and erosion) all the action is taking place on the canyon floor. Note the arcuate sand wave-like features. There is another paper coming out soon about these features that I’ll post about in the future – very interesting stuff.